Earn up to 17,495 reward points. Top-notch Taylor with innovative bracing for better performance and intonation. The essence of the Taylor playing experience lives within the rosewood/spruce 814ce V-Class guitar. 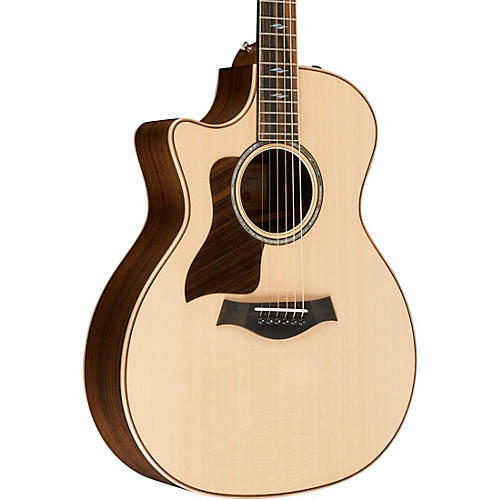 With the debut of its comprehensive redesign in 2014, master guitar designer Andy Powers took what was already Taylor’s flagship guitar and deployed an array of voicing refinements, ranging from customized bracing and wood thicknesses for each body style to the use of protein glues and ultra-thin finish, to bring out another level of musicality. Taking these enhancements one step farther in 2018 with Taylor's innovative V-Class bracing, together, these elements deliver much more than the sum of their parts. For everyone from pros to hobbyists, they make the playing experience more expressive, inspiring and fun. The volume, the sustain, the "in-tune-ness" of the instrument and its high-fidelity sonic detail all combine to deliver a new level of player experience. The 814ce-LH V-Class guitar comes with Taylor Expression System 2 electronics and ships in a Taylor deluxe hardshell case for optimal fit and protection. A guitar's top is the primary filter and distributor of vibrating string energy through the guitar, which means it has a huge impact on its sound. Sitka Spruce is the most prevalent guitar top wood of the modern era. It blends stiffness and elasticity in just the right proportions which translates into broad dynamic range with crisp articulation. Solid Indian rosewood back and sides complement the Sitka top with sound that's made it one of the most popular tone woods ever. Rosewood produces the strongest bass response among the tonewoods commonly used for guitars, with a slightly scooped midrange. Rosewood's sweeping frequency range - deep lows that assert a throaty growl with sparkling highs - rings out with bell-like, high-fidelity clarity. It yields a full-range acoustic voice with complex overtones and extended sustain. Taylor's V-Class bracing is a fundamental innovation in acoustic guitar design. It marks an important evolution beyond traditional X-bracing, introducing an entirely new platform for acoustic performance. It is essentially a "sonic engine" that optimizes the response of an acoustic guitar in three key ways: by boosting volume, sustain, and by largely resolving the intonation (in-tune-ness) issues that have long plagued acoustic guitars. V-Class bracing creates purer, more orderly notes that don't cancel each other out or sound "off". They have clearer, more consistent response, and the whole fretboard is brought into greater sonic alignment for a more musical playing/listening experience. Guitars with V-Class bracing are easier to tune; the pitch sounds purer and more solid, and electronic tuners can more easily locate notes for quick, precise tuning. Other benefits: harmonics ring more uniformly down the neck, notes are louder with more projection and sustain, and notes are more consistent, i.e., upper register notes don't get choked out or swallowed. Fewer "sour" sonic qualities exist with chords; a more agreeable relationship is created between notes as they ripen, bloom and decay. Grab this terrific Taylor today with a quick click or call.